Weak and Empty • Run Hard. Rest Well. I know Him. Do I need Him? Do I acknowledge that need? On a regular basis I need direction, hope, courage, healing, truth, land love. We need all that and more, but there’s a need in our lives we often fail to identify. We are desperately needy. We are finite and prone to emptiness. We need to be filled, fueled, fortified. Our mountain trek is too hard, too daunting, too demanding. It requires more than we have. Running weak and empty is not a crime. Say that out loud. 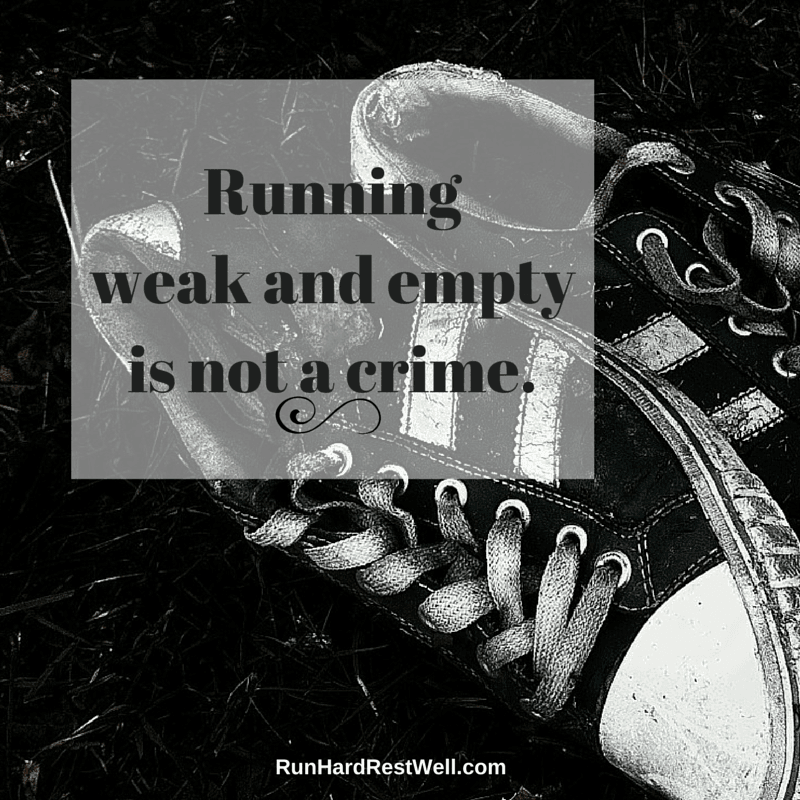 Running weak and empty is not a crime. In this truth there is no shame. Being empty is a daily, weekly reality. It’s a way of life and it’s a beautiful way of life. Why? Because it causes us to come empty handed to the One who is Infinite and Able. 2 Corinthians 12:9-10 says it best. Starting next week, we’re relaunching a series of blog posts, which invite us to a life of rhythm and rest, where running hard is a joy and resting well is a commitment we are no longer willing to forfeit. These posts explore the practical “how to’s” of rest for the 21st century with 4 biblical rhythms: Sabbath, Sleep, Stillness (personal prayer) and Solitude (personal retreat). 2015 stands before us. Are you up for a challenge? Pray about it. It’s an invitation that will take you out of the desert into the Promised Land. It requires a leap of faith, however. It’s not for the faint of heart. Make it an expedition, not just a journey. Ask a friend, a coworker, your spouse, your small group to sign up for the blog and join you. Embracing the motto Run hard. Rest well. is a counter-cultural move. The buddy system creates an arena for dialogue, encouragement and accountability…key factors in turning our desire for change into a reality of transformation. Continue to pray. As rhythms of rest take hold of your life, you will become a natural model and mentor for others, an opportunity that is both a privilege and a responsibility. Learning how to rest well sets us up for a life of treasures instead of trinkets. Powerful, Brenda. I praise God that you will relaunch this series. I’m seeing more and more that we push past our abilities, and responsibilities, and keep going, but we don’t imbibe on the Living Water that guides and directs us on the right path. We don’t seek the Father for our direction much less our energy and we die a little bit at a time. I pray God, that people will grasp hold of the understanding that we must grab hold of the altar of God and not let go until His hand is in ours. Then we will be filled with nutrition and not empty calories. And we will be satisfied.